A collection of the ancestry projects with some students. Front (from left): Heidi Decker, Kaitlyn Wood, Havyn Merwin, and Ransom Dutcher. Back (from left): Owen Clough, Peyton Tweedie, Rachel Trimbell, Logan Aubin, Makara MacGibbon, and Caden LeBarge. Eighth graders at Walton Central School had the chance to connect and learn about generations of their family history during a month-long project in Melissa Grossman’s social studies class. 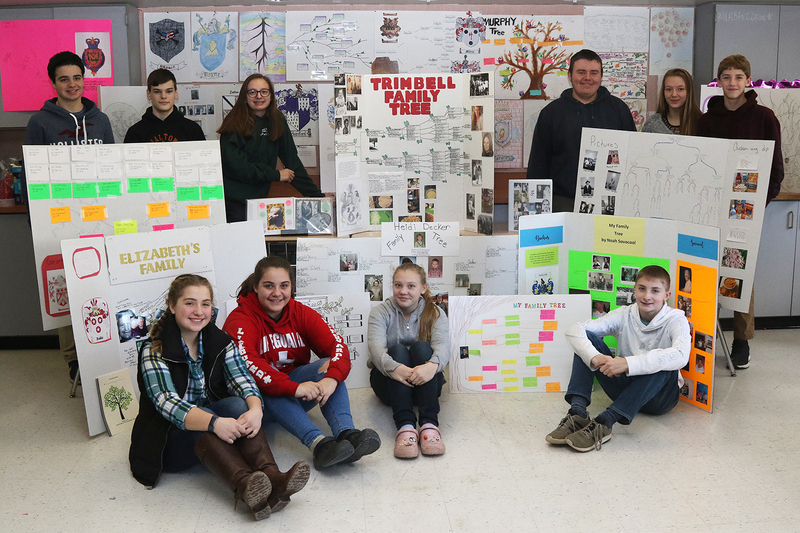 The 70 students recently completed a three-part family history project as part of their studies of immigration, which is a required topic in the New York State social studies standards for 8th grade. Using resources available through the popular genealogy website Ancestry.com, along with obituaries from local funeral homes such as Courtney Funeral Home in Walton, information from the Walton Historical Society and local history enthusiast Richard Grossmann, family documents, oral histories, photographs, and ship manifests from the Statue of Liberty- Ellis Island Foundation, students traced their heritage with the goal of finding their immigrant ancestors. Access to Ancestry.com was provided free to the students via a grant. The eighth graders found that they are descended from people who lived all over the world. The majority of students unearthed roots in Northern and Western Europe, descending from people who came from England, Ireland, Scotland, Germany, and Norway, which is very common for people who live in the Northeast of the United States, and especially in Delaware County. Other students located ancestors who emigrated from Central, Southern, and Eastern Europe. For example, Rachel Trimbell, who developed a real passion for genealogy during the project, located ancestors in Austria-Hungary and the former Czechoslovakia. Two other students had ancestors even farther into Eastern Europe in Lithuania and Russia. A few students have heritage that links them to farther reaching places in the world. Gianni Marano and Chloe Madrigal have roots in Asia, specifically Vietnam and the Philippines, respectively. In addition to finding out about their immigrant ancestors, many eighth graders learned that their ancestors have been in America since Colonial times, or even earlier. David Brooks and Logan Grossman both found ancestors living in America as early as 1609. Jayven Mason traced his ancestry back to Edward Doty, one of the passengers on the Mayflower. Jayven also successfully traced his ancestry the furthest, all the way back to 1480 in England. Along with these findings, there were other more curious discoveries ranging from child brides, numerous crimes including a bank robbery and murders, possible Mafia foul play, FBI investigations, and possible CIA related deaths. In addition to the ancestral research, the eighth graders also had to look into the meaning and origin of their surnames, locate or create a coat of arms for their family, and choose from a number of mini-projects such as family military service, oral history interviews of relatives, genetic traits, migration paths, ancestral occupations, or the favored choice tradition, culture, and food, which required students to research a food traditional to their family or their heritage, prepare the dish, and share it with their class. Of the 70 eighth graders, 30 students prepared delicious dishes including ethnic foods such as Indian Chicken Tikka Masala, German bratwurst with sauerkraut and potato pancakes, Polish kielbasa, Hungarian goulash, Austrian strudel, Swedish meatballs, Italian Neapolitan cookies, English shortbread cookies, Irish mint brownies, as well as family recipes such as homemade white bread, blueberry coffeecake, cornbread, chocolate mousse and many more. “I couldn’t be more pleased with the hard work and perseverance my students and their families put into this project,” Grossman said about her students. “They really went above and beyond, throwing themselves all into the assignment and producing very high quality work. For a gallery of images from the project, please see below.